Do you know the best way to spot a liar? If they are being represented by Gloria Allred, you can be certain of it! Stamp a big, capital “L” on that individual’s forehead. He or she is as credible as Bill Clinton. Judge Moore is clearly innocent of the charges Gloria Allred and her trained seal Beverly Nelson have placed against Judge Moore in the court of public opinion, that horrid place where due process does not exist, the judge and jury are the liberal mainstream media, condemning conservative defendants as guilty until proven innocent, and the punishment is typically a life sentence. Several witnesses have come forward to debunk every single claim Nelson and her liar attorney have made. Many of the details of the restaurant, Olde Hickory House, where Nelson claimed to have been employed, do not match anywhere near recollections of people who were actually employed there. Not even close! Furthermore, there has not been a single person come forward who says he or she remembers Nelson being employed at Olde Hickory House, but several people who were actually employed there during that time claim that Nelson was not employed there (seems like a simple Social Security inquiry would confirm whether Nelson was employed there or not). Also, there is a reason that Nelson and Allred will not allow the yearbook signature to be analyzed (working on another article on that to be published later today). The signature is obviously and completely bogus (forged). Allred should not only be disbarred for this charade, she should be prosecuted! 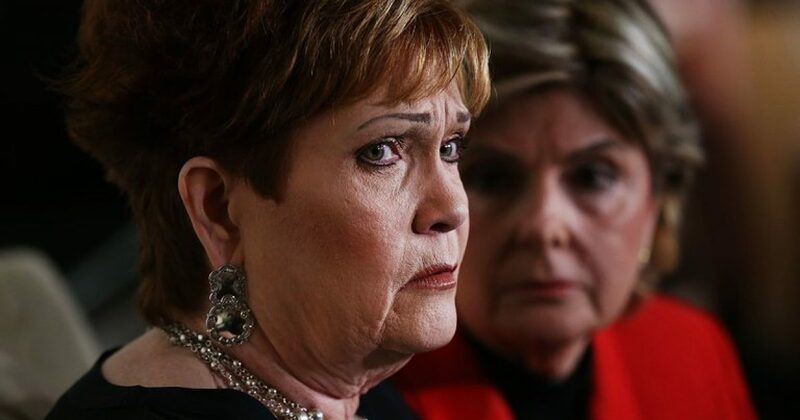 GADSDEN, Ala. – On Monday evening, the Moore Campaign unveiled statements from key witnesses that completely bust the story of Beverly Nelson and Gloria Allred and further reveal an unconscionable bias on the part of state and national press to hide the truth from Alabama voters who will undoubtedly see through the “fake news” and elect Judge Moore for the man that they have always known him to be. According to a former waitress, Olde Hickory House required employees to be 16 years old. Nelson claims she was 15 when she started. According to two former employees, the dumpsters were on the side of the building. Nelson claimed that they were in the back. Rhonda Ledbetter, who worked at Olde Hickory House for almost 3 years, states that the earliest it closed was at 11 p.m. but she believes it was open until midnight. She is certain it did not close at 10:00 because Goodyear was next door, and employees came to eat when their shift ended at 10 p.m. Nelson claims her story occurred after the restaurant closed at 10 p.m. It is unlikely that there was an entrance from the back of the parking lot, which Nelson claimed existed. Multiple sources have claimed that everyone parked on the sides of the building because there wasn’t much room behind the restaurant, according to Rhonda not enough room to turn around. Renee Schivera stated that a neighborhood backed up to the parking lot and it was adjacent to the backyards of people’s houses, so she did not see how there would have been a back entrance as it would have gone through someone’s yard. Nelson claimed that Judge Roy Moore came in almost every night and sat at the counter, but former employees state that customers at the counter were served by the bartender or short order cook – not served by the waitresses and had no reason to interact with the wait staff. Additionally, two former waitresses and two former patrons state they never saw Judge Moore come into the restaurant. These witnesses have shared their testimony with multiple news outlets. The outlets have failed to report. Rhonda Ledbetter, a retired public school teacher who is currently the senior choir director at a Baptist church and teaches children at a local, church-sponsored day care center, was a waitress at Olde Hickory House for almost three years from 1977-1979. She was a college student at Jacksonville State University at the time and worked varying shifts at different times of day, multiple days a week during the time of her employment. She said in a statement: “When I heard Beverly Nelson’s story, there were several details that were different from what I remember. I was nervous at coming forward because of all the attention this story has gotten, but as a moral and ethical person I had to speak up about what I know to be true. I was a waitress at Olde Hickory for almost three years from 1977-1979, and I never saw Roy Moore come in to the restaurant. Not one time. And I would have noticed because most of our customers weren’t wearing suits, especially not at night. Many customers worked at Goodyear next door and would stop in on their way to and from work, and I don’t remember anyone from the courthouse coming in at all. That just wasn’t our crowd. “A few things stuck out to me. First, Nelson said she was 15 years old when she started working there but you had to be 16. I don’t remember her from my time there, and I don’t remember any 15 year olds working there at all. “Second, Nelson said the restaurant closed at 10 p.m. but I know the earliest it closed was 11, though I believe it was midnight. I’m certain of that because Goodyear employees came in to eat after their shift ended at 10:00 p.m., so there’s no way we would have closed at that time. “Third, the area wasn’t dark and isolated as she described. Rather, the building was right off the busy four-lane highway and people and cars were always around. The restaurant had a wrap-around porch, like the ones at Cracker Barrel restaurants, and there were lights all around the sides of the building. So it wasn’t dark and anyone in the parking lot was visible from the road. “Fourth, the dumpsters were to the side of the building, not around back and there sure wasn’t room to park in between the building and the dumpsters. People from the kitchen would take trash out of the side door and throw it right into the dumpsters. We were always told to park on the side of the building, because there just wasn’t much room behind it. I don’t remember there being an exit from the back of the parking lot, there would barely have been enough room to turn a car around.